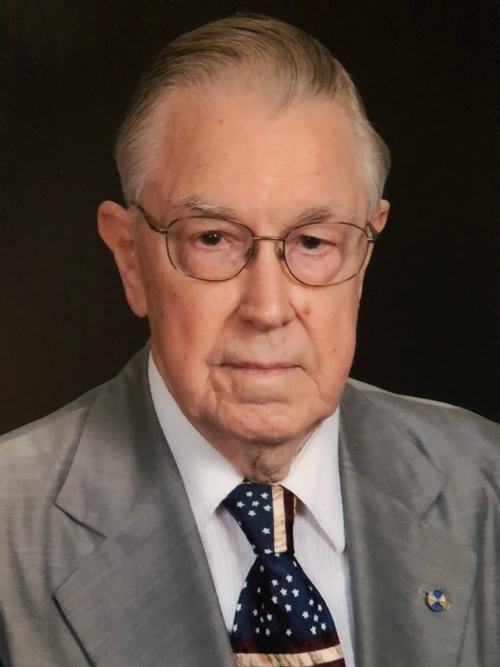 William E. (Bill) Berger, FUMC member for almost 53 years, died Wednesday, April 11, 2018, at age 99. He was born in Ferris, Illinois, to William George and Ethel Nelson Berger, on June 6, 1918. As a young boy, he delivered newspapers to neighbors for a few cents a week in his hometown. His career in the newspaper business began as a teenager in western Illinois, selling subscriptions, writing stories, delivering papers and doing anything he could to earn a modest living during the Great Depression. He attended Carthage (IL) College and worked at several newspapers in the Midwest as a circulation manager and as an editor. In July 1942, Berger entered the U.S. Army and was sent to Camp Swift, near Bastrop. He met his future bride, Jerry Barnes, at a barbecue for soldiers hosted by co-eds of the Home Economics department at UT. They were married on February 26, 1943, in the chapel at Fort Sam Houston in San Antonio. After spending four years in the U.S. Army, Bill returned to Texas where he and Jerry purchased the Hondo Anvil Herald in 1946. Working many long hours together, side by side, they published the Anvil Herald and raised three children. Bill was a long-time member of Lions Club International, including the Founders Club in Austin; Sons of the American Revolution; American Legion; Veterans of Foreign Wars; and the Headliners Club of Austin. He was preceded in death by Jerry, his wife of almost 75 years; his parents; and his two sisters, Helen Berger and Betty Galvin. He is survived by his children Ed (Jan) Berger, Barbara (Glenn) Wilson, and Jeff (Tracy) Berger; grandchildren Meredith (Spencer) Chambers, Emily (Brad) Buchanan, Greg (Jennelle) Berger, Chris (Angela) Wilson, Kevin (Paige) Wilson, and Lexie and Lindy Berger; and great-grandchildren Abby, Will, and Ava Buchanan, Phillip and Braden Chambers, Carson and Trent Berger, and Austin, Reagan, and Anderson Wilson. Visitation will be held Sunday, April 15, from 4-6 p.m. at Weed-Corley-Fish, 3125 North Lamar, Austin. Following a private family burial service at the Texas State Cemetery, a memorial service will be held on Monday, April 16, at 2:30 p.m. at First United Methodist Church, 1201 Lavaca, Austin. In lieu of flowers, memorial contributions may be made to First United Methodist Church ( fumcaustin.org ), Samaritan’s Purse ( samaritanspurse.org ), or the charity of one’s choice.